This morning I decided to go for a little drive to visit some country oppies. Usually my thrifting consists of popping into the op shops on my way by or when I have 10 minutes to spare. But today, Lulu and I headed out for a morning of thrifting in it's own right! We visited 4 op shops and picked up a few bits and pieces including these lovely linens. Some beautiful florals, a lovely paisley, some great prints for a 'vintage boy quilt' too. A very pretty flannel pillowcase, so soft with just the perfect amount of wearing. And to top it off a linen tablecloth in perfect condition and some fun, bright floral runners. Hopefully a bit more show and tell on Sunday! Have you been thrifting this week? I hope you've found something you love! Great finds - love the colours! What beautiful linens Lea....and the dresser makeover is GORGEOUS!! I was so worried when I heard about the flooding in your region....Im so thankful that you are ok. I too would be super pleased with this haul! 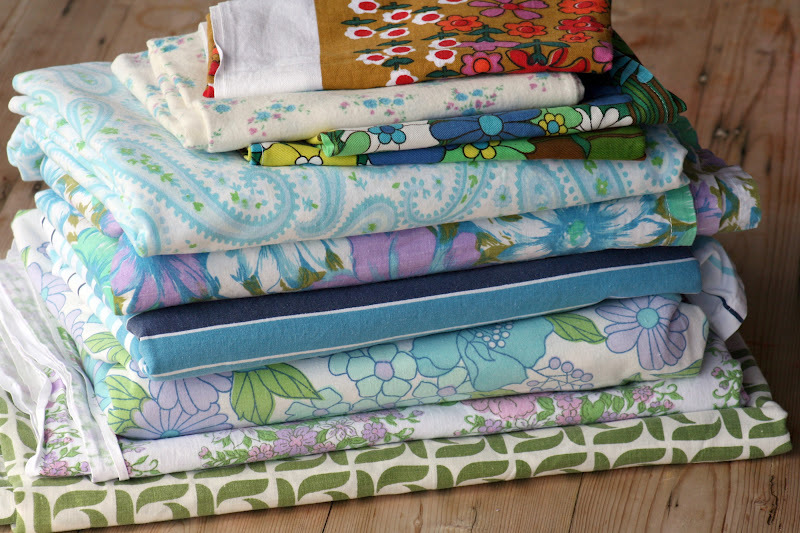 especially love the floral print 3 down from the top in your stack: the runners I think? love bold floral prints.